This textbook provides a thorough presentation of the phenomena related to the transport of mass, momentum and energy. It lays all the basic physical principles, then for the more advanced readers, it offers an in-depth treatment with advanced mathematical derivations and ends with some useful applications of the models and equations in specific settings. The important idea behind the book is to unify all types of transport phenomena, describing them within a common framework in terms of cause and effect, respectively represented by the driving force and the flux of the transported quantity. 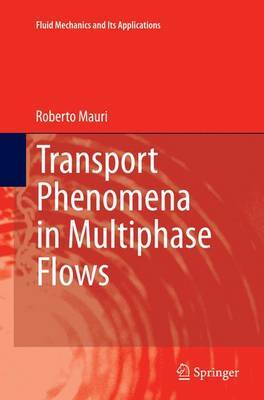 The approach and presentation are original in that the book starts with a general description of transport processes, providing the macroscopic balance relations of fluid dynamics and heat and mass transfer, before diving into the mathematical realm of continuum mechanics to derive the microscopic governing equations at the microscopic level. The book is a modular teaching tool and can be used either for an introductory or for an advanced graduate course. The last 6 chapters will be of interest to more advanced researchers who might be interested in particular applications in physics, mechanical engineering or biomedical engineering. All chapters are complemented with exercises that are essential to complete the learning process.